I don't know about you lot, but I absolutely LOVE watching all of the What's in my Bag videos on YouTube! There is something therapeutic about finding out what other people's handbag essentials are and how we're all different in some way! My bag is the famous "City" bag from Zara a few seasons ago. I bought the bag after the hype I'd seen it get from bloggers and celebrities. 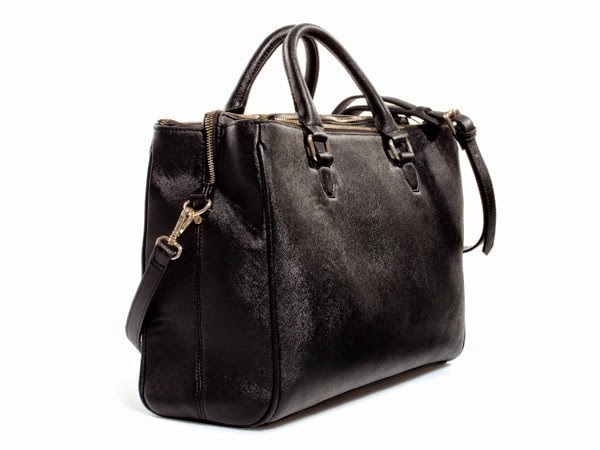 Its the perfect bag for work because it has so many different compartments and space for a laptop too! Although the bag was rather pricey (£59.99) I definitely think it was worth the money! The bag is black and has a square shaped to it. It has many different pockets and compartments and is so versatile you could use it for work or university (like I do) or even use it on a day to day basis. I'd even take it to an evening meal to smarten up a plain outfit! I like that it has so many different compartments and that one of the zipped compartments has an extra padded sections that you can fit a laptop in which is perfect for taking your laptop to university! Also the two larger zipped compartments meet together when clipped so that it covers the middle section therefore making your bag safe to take out in the horrible English Weather! I'm a big bag girl, don't get me wrong .. I love a small clutch or handbag for a night out but on a day-to-day basis I like to have a lot of things with me (I'm definitely one of those people that has platers, pens, clips, perfume, chewing gum - basically everything!). I really like this bag, It's my perfect bag to use for work as it's smart and black but I also love using it for university as it has so many compartments to cram all my stuff into! What bags do you guys use for work and University?